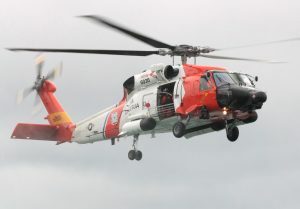 The US Coast Guard rescued three commercial fishermen on Sunday morning after their fishing vessel COASTAL REIGN began taking on water. The crew reported that their vessel struck a submerged object as they navigated the mouth of the Columbia River. Watchstanders at Coast Guard Sector Columbia received the captain’s mayday call (listen here) at 3:20 a.m. An MH-60 Jayhawk helicopter was launched, and first to arrive on the scene at 3:38 a.m. A 47-foot motor life boat from Ilwaco, Washington arrived shortly thereafter, and assisted with the dewatering of the fishing vessel. The dewatered vessel was then towed to safety and moored at 4:40 a.m.
On November 26th, 2016 the Coast Guard rescued an injured crew member more than 170 miles offshore from the Columbia River. The 23-year-old man was aboard the 617-foot Global Saikai, which had left Longview, WA for Kashima, Japan carrying a load of timber. 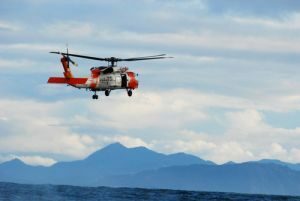 Coast Guard Sector Columbia River received the call after the crew member fell from a ladder and broke his arm. An MH-60 Jayhawk helicopter crew was launched from Warrenton, OR to transfer the man to emergency medical personnel, who in turn took him to Columbia Memorial Hospital in Astoria, OR. Weather at the scene was reported as raining with light wind, 13 foot seas and 9 mile visibility. The Oregon State Department of Environmental Quality and the US Coast Guard responded to an 82-foot sunken tug at 8:49pm on the evening of Sunday, September 25th. The Earnest, a wooden-hulled vessel, sank on the Columbia River in Goble, OR. The incident was reported via the National Response Center. 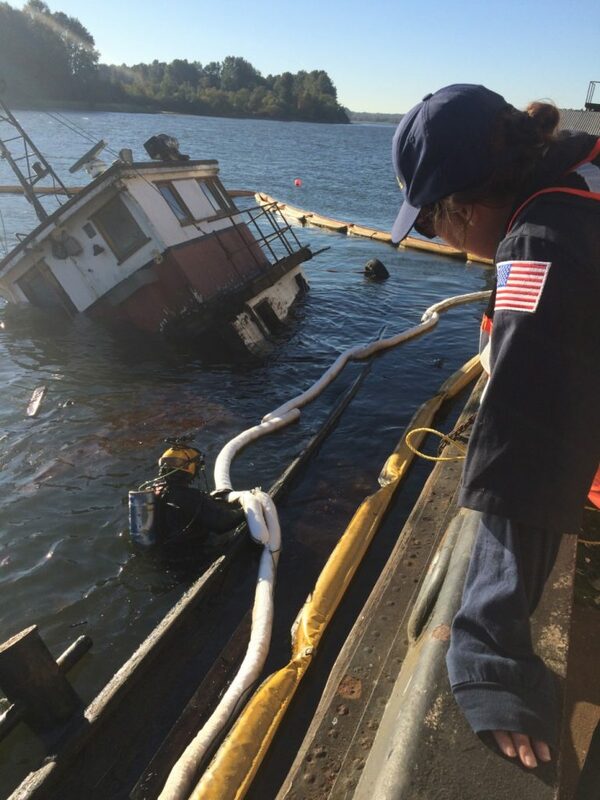 Divers from Ballard Diving were contracted by the Incident Management Division in Portland to assess and address any fuel or other sources of pollution which may have been present after the sinking. Clay Jonak, the owner of the Earnest, reported the vessel was carrying approximately 100 gallons of residual diesel fuel when it sank in Columbia County. Several other older tugs and barges are owned by Jonak, which he is attempting to salvage and scrap.